28-year-old Hoffmann, who is a former World No.1 ranked amateur and just wrapped up a full season on the PGA Tour, revealed that he was diagnosed last November but is determined not to let it stop him achieving his goals. Hoffman titled his piece 'So Damn Lucky', and revealed that the incurable disease is currently attacking his right and left pecs to atrophy, but he is unsure where the disease will attack next. However, admist what must be an incredibly difficult time, Hoffmann is inspiring. He talks about his journey, why it's caused him to live every day to the fullest, and that he's now focusing on raising money for charities that help others with the disease. To read Hoffmann’s full article, click here. "In 2011, I started to notice that my right pec was deteriorating," Hoffmann wrote. "I could see it in pictures and in my reflection in the mirror. So I started to seek the help of specialists all over the country, and even several in Canada." "That was the beginning of a five-year period of misdiagnoses, frustration and confusion. I visited over 25 doctors. While they were 'racking their brains,' my weakness progressed, my swing speed decreased and I continued to lose muscle in my chest. Today my entire right pec is almost gone." Hoffman has been on Tour since 2013, but has remained a quieter figure on social media than a lot of his peers. On Monday, he decided to change that, and use his voice to help others moving forward. "I like to keep my personal life private — I don’t have as many Twitter or Instagram followers as some other players on Tour; and I definitely don’t post all the time on social media about what I happen to be doing at any given moment. "But today I’m emerging from behind the scenes. Not because I want to talk about myself necessarily, but because I hope that by doing so I will be able to help find a cure for the disease that I and thousands of others are afflicted with. "I am determined to help make a difference. I cannot wait to start raising money and awareness to fight this disease! Soon, I will be announcing the date of a charity golf event that I will hold at my home course, the Arcola Country Club in Paramus, New Jersey." 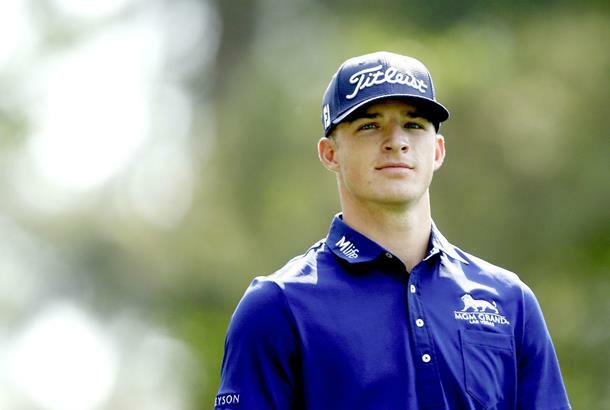 "This disease won’t keep me from achieving my dream of winning on the PGA Tour — and it shouldn’t keep anyone else from chasing their dreams either," Hoffmann wrote. "I’ve found my calling, and it’s one far beyond golf." Since posting the news on social media, he's been inundated with messages of support from fans and Tour players.